What's In a Granite Countertop? What’s In a Granite Countertop? 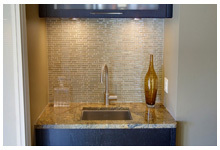 Granite is primarily the most preferred choice of stone amongst the home owners when it comes to kitchen countertops. They prefer it over marble and quartz countertops due to its many benefits. Granite has a sleek and sophisticated look that gels with the time and it never makes the stone look old or out of place. Once you have installed a granite countertop at your kitchen, then you have got a lifetime of style statement at your home. Granite speak volumes about your taste and the way you want your home to hold up with the designs and styles of the future. Granite is made to last and the surface that you choose for the stone remains the same till the life of the home. When the granite is finished, utmost care is given to finish the surface for the right mix of colour, texture and the grain patterns. What you get after the finishing is a slab of stone that looks more like a piece of art. As granite is sourced from all over the globe, no two granites have similar patterns. Here are certain things that goes in the making and formation of the granite, giving it its unique and amazing features. It takes many years for the granite to form and it also requires all the right conditions. Granite is also known as igneous rock, as it starts its journey as molten lava that is also called as magma. The magma stays under intense pressure over the periods of time and starts to melt with minerals and crystals surrounding it. What comes in the end of this process is known as granite. This similar process happens around the world and is often found near the mountain chains where the magma is ballooned up. This makes it very strong and durable in the formation process. This is the main reason why it is considered the best stone to be used in the kitchen countertop. Granite has a unique blend of minerals. The two main minerals in the granite stone are Feldspar and quartz. The scale on which the hardness of the granite is measures is called “Moh”. Feldspar and Quartz have 6 and 7 rating respectively on the scale where 1 is being too fragile and 10 means ultra durable. When these two minerals are combined together, they form a rock that has strong surface, resistant to heat and scratches. That is why granite is considered one of the best choices against the daily wear and tear on the kitchen countertop. Each slab of granite is available in various unique colour combinations that make it perfect for everyone, who is looking for stone to match with the rest of the decor in the house. The colours are vibrant, the lines have specific texture, and the specks have patters that are never same in two stones. You also have the choice to select a big or smaller slab, depending on the size of the kitchen.